Nice job Ranchand....Team Spurrfect on the board in a BIG way! Thanks guys!OK is that a rio?Nice! Here is the Osceola that I harvest at 11:30 on 3-31-08. 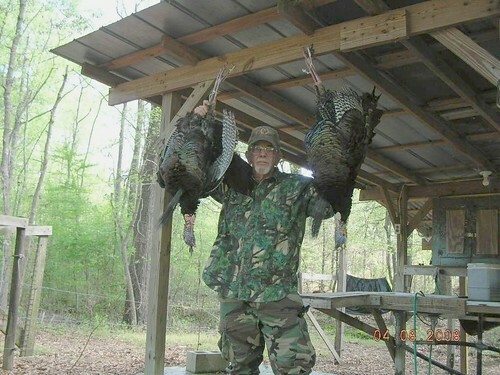 I took this Gobbler after missing three times (1 was my fault the other two were Red Dot Malfunction) over two days. I guess third time is the charm! After not hearing a thing at the first spot that I set up. It was overcast and threathening to rain. It sprinkled a little bit and I decided to go try the spot were I had missed a good Gobbler the morning before! I headed to the truck and drove to the area. I put on my vest and grabbed my gun afte putting a Flambeau Pro Series Hen and Challenging Jake in my Game pouch. Once I walked to the area and crossed a small creek, I entered the area that I wanted to hunt. This area is a circle shaped clear cut that has been recently burned. It is totally surrounded by Cabbage Palm Swamp. the burnt areas is approx. 400 yards across and 500 yards wide. Allow this field had been recently burned it had an abundance of new growth already sprouting! The whole area was eat up with Turkey and Deer sign! Once I entered the Cut, I move to the right to a place that I had scouted out as a good setup opn Friday. The set-up was located just off the edge of the Cut and had great cover. There were a couple of small pines in front of me and I was set-up against a good size Oak tree. I set the Decoys about 25 yards away and went back to my hide. I waited about 20 minutes to let everything settle down and then made a short series of yelps on one of my Double Slate Calls. I got an immediate reply. I made one more short series of yelps to make sure he was answering me. 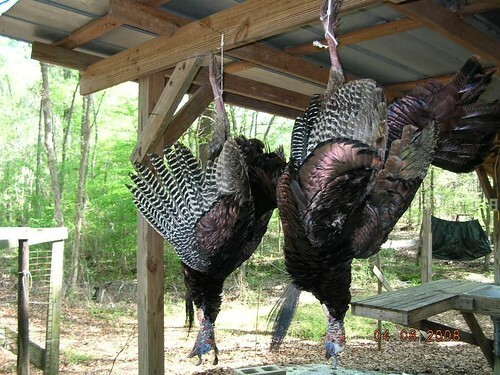 I got a second Gobble and put the Call down and got ready to shoot! Little did I know how long I would have to wait! After not hearing anything for approx. 20 Minutes I made another series of Yelps, nothing. I waited another 20 Minutes and repeated this sequence, Nothing! I decided that I needed to sit tight and let things work themselves out! 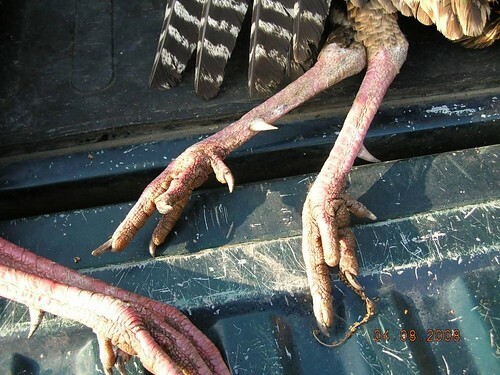 I figured the Gobbler had Hens with him and Gobbled but didn't come until he was finished with the business at hand! I slid my Seat Cushion forward and stretch out to wait him out! I waited about an hour and then made a short series of yelps on a Cedar Box Call, Nothing. I decided that I needed to get more agressive, so I cutt on the same Box Call and got an immediate response. I then cut him off and cutt hard at him and then got passive making a soft series of yelps. He Gobbled at every Call I made and then I saw his Head first and then his Fanned out Tail. He was soming in fast and on a string! He had to go through a little depression and all I could see was the top of his Fan. When he came out of this Depression and saw the Hen with the tending Jake, he did something that I have never seen a Gobbler do. While he was still Fanned out and had his wings down Strutting he began to run toward the Decoys. It is the strangest thing I have ever seen! A Gobbler in Full Strutting Running toward my Decoys! When he made it to the Hen, he started Spit and Drumming. Once he passed the Hen and moved toward the Jake he was all business! He flogged the Jake with his Wing twice and then pecked him! At this point I had seen about all I could take. I had one of the Lime green Goofy bat Wing Diaphragms in my mouth, the safety off and the Gobbler in my sights. I cutt at him and as he raised his head, I squeezed off the trigger and watched as he began to flop! 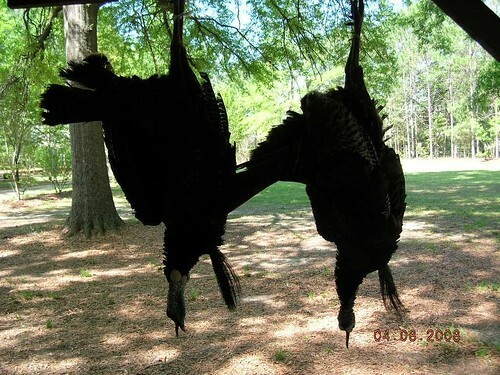 I let out a war hoop and ran toward the Gobbler! I was on happy Turkey Hunter! I said a short prayer and then began to pack up and head toward tmy truck and then the check station! Mission accomplished! Now it is time for Osceola #2 before I head to Kansas for Rio's and then New York for Big Easterns. I may try to go to S.C. if I can find the time inbetween! FOR my dear friend Dane - GOD BLESS YA! - NextYR you gotta put up with me! Folks - if it wasn't for this contest and us gettin' placed on the same team -I would have never met this fine ole fart! Now you know why this contest is dear to my heart. I have a friend for life to which I treasure greatly. Bird No:1: Beard-11 &amp; 3/4 in. Right spur: 1 &amp; 1/8 in. Bird No:2: Beard-11 &amp; 3/16th in. Right spur: 1 &amp; 3/16 in.